Scavenging and Hunting in Early Hominids. When did our earliest human ancestors first begin to scavenge for meat and first begin to hunt? This is a difficult question to answer with certainty. We cannot ask them, and their few surviving fossils offer clues that are at best inferences. The question must be approached using very limited data. Nonetheless, by using several approaches to the question, a very plausible answer seems within grasp. I hypothesize that both scavenging and hunting coincided with the emergence of the genus Homo. I will first discuss the several areas of evidence that have entered into this inquiry. Thereafter I will discuss the species of hominids in relation to the evidence. Fossils, though few and rare, are by far the most important evidence we have of hominid evolution. Fossils and paleoarchaeological excavations have provided both anatomical evidence and indications of behaviors. In addition to the scant evidence offered by fossils, an understanding of evolution and its relationship to paleoecology and climate changes offers useful clues and some possible answers. Paleoclimate studies evidence the temporal alterations in the forces that have influenced hominid evolution. The fossil record evidences branches of the primate tree that failed to adapt to environmental and ecological change and perished. Approximately 16 mya, during a warm climate epoch, Pliopithecus and Dryopithecus, two genera of primates, migrated from Africa into Eurasia. These species are particularly illustrative to the present discussion because they were vegetarians, and therefore not preadapted to an ecology with fewer plants and a cold season. They became extinct due to the climate cooling about 14 mya, except in tropical Southern Asia where they evolved into Orangutans (Pickford, 1968). During the warmer period in Eurasia and in the forests of tropical and subtropical Africa there was no reason to switch to meat. More than 100 food plant species suitable for primates are available in the equatorial forest. This prolific ecology, which was originally spread across the entire African equatorial belt, was greatly reduced in the east by the sinking of the Rift Valley. There also the hominids had to adapt to a landscape with reduced vegetation or perish (Pickford, 1990). The survival pressures may not have been as extreme as at more northerly latitudes. In this scenario, in Africa around 5 mya ago, Australopithecus equipped with new survival tools, bipedalism and a slightly larger brain, evolved. These preadaptive features may have ensured their survival and our evolution during a cooling event in the Late Miocene epoch (about 6.0-5.3 mya). This correlates well with the time at which apes and hominids diverged (Larick and Ciochon). Increased brain size had occurred several previous times in our evolution. Those events support the hypothesis that changes in the environment and ecology, and their consequent pressures, can select for greater brain size. Approximately 220 mya, at the beginning of the evolution of mammals, a major encephalization occurred. A second major encephalization occurred following the Mesozoic extinction 65 mya, when a dramatic change of the niches of mammals took place. "In mammalian and primate history, one of the major responses to changes in environment was the enlargement of the brain in relation to body size," according to Brunetto Chiarelli. Given this correlation, a significant increase in brain size can also infer an epoch of changes and new adaptations. The size of the hominid brain has increased from about 500 cc. to 1500 cc. during the last 2 to 3 million years, the largest quantitative evolutionary change in the history of the mammals (Chiarelli, 1996). This vast change can be viewed as a temporal graph of adaptive history. Pinpointing when the greatest changes occurred can illustrate periods of new adaptations and extreme survival pressure. Another area of evidence that merits attention is behavioral ecology. With fossil species, the difficulty arises in trying to find evidence of behaviors. Studying an animal in relation to its environment involves understanding the quantity and quality of different kinds of food, distribution of food resources and water, predators and group size. Groups can form in response to predation. Behavior, to be an inherited trait, must have an impact on reproductive success, such as living in groups increasing predator detection (Paxton). In primates much observed behavior is a result of learning rather than genetic, and is passed from generation to generation as part of culture. Tool use is such an acquired behavior. An example is termite extracting with sticks by chimpanzees. Learned behaviors can also impact reproductive success and evolution. Fossils offer some evidence of behaviors. Teeth can be viewed microscopically to discover the kinds of foods chewed. The microscopic scratches and pits that form on a tooth's surface as the result of chewing are useful evidence. Heavily pitted molar surfaces typically suggest a diet consisting of harder food items (such as hard seeds, nuts or bone). In contrast, a heavily scratched shearing facet on a molar tooth usually indicates that the tooth was used to shear food items (such as leaves or meat). Intermediate patterns indicate mixed diets. Dietary differences are revealed by comparison of microwear images of two fossil apes from the late Miocene of Europe, Ouranopithecus and Oreopithecus: The heavily pitted surface on the molars of Ouranopithecus macedoniensis suggests the consumption of harder food items such as nuts or tubers. The heavily scratched surface on the molars of Oreopithecus bambolii suggests a diet comprised of leaves or other soft objects. Tools are also valuable evidence of behaviors. Tools have been encountered in association with fossils. And because the earliest hominid tools are associated with scavenging, they are our most valuable behavioral evidence in relation to carnivorous activity. The first hominid tools provided a technology that added a first stage to digestion, preprocessing foods and giving early hominids access to a wider range of nutritional resources, imparting a survival advantage. Stone tools are extensions of the forelimb and hand for breaking down or processing tough foodstuffs (Larick and Ciochon). "Fragmentary fossils representing the emergent genus Homo are consistently dated to nearly 2.5 mya at various points in the eastern Rift Valley. Likewise, as the earliest stone tools, also found in the eastern Rift, have equal antiquity, the emergence of one must be linked to the other. By 1.9 mya, Homo ergaster presents undeniable morphological features for moving great distances: long torso and limbs, narrow hips, a large brain and reduced dentition. With the new evidence from Longgupo, Java and Riwat, it becomes clear that early Homo (the immediate ancestor to Homo ergaster and Homo erectus) and simple stone tools arrived in tropical and subtropical Asia by about 2.0 mya." Genus Homo had crude bifacial tools by 2.0 mya. These became the distinctive Acheulian biface tools about 1.5 mya in the eastern Rift in Ethiopia, and in Peninj and Olduvai Gorge in Tanzania. Acheulian bifaces are found in Israel by 1.4 mya. Early Acheulian tools are associated with H. ergaster or H. erectus (Larick and Ciochon). What enabled the early migration out of Africa? It certainly was not the diet of 100 plants in tropical forests. Two sequential patterns of subsistence behavior are evidenced in the tool and fossil record. The first, at the earliest stone tool sites about 2.5 mya, occurs near natural features termed "catchments" to denote the presence of numerous complementary resources. Here large, diverse accumulations of bone and stone waste indicate significant occupation. After exhausting one catchment's resources, the group would presumably move to another. Larick and Ciochon term this "catchment scavenging." This pattern was followed by a more territorial approach. It is the first adaptation that temporally corresponds to the dispersal of hominids out of Africa. The capability to migrate across vast distances and into new ecological niches with different plants is indirect evidence that the emergent Homo species was relying on meat to survive. The coincidence of climate change, emergence of the earliest Homo, the appearance of stone tools, and species dispersal provide rather convincing evidence of meat scavenging by this point in hominid history. New adaptations and behaviors should correspond to increased brain size. As we have already observed, selective pressures were responsible for the increase of the brain size at earlier points in our evolution. During the evolution of Australopithecines into Homo habilis and H. erectus brain size more than doubled. This supports the other evidence of new adaptations. Let us move on to an examination of what we know about the individual fossil hominid species, with attention to the factors in the foregoing discussions. We know that monkeys and apes are plant eaters. Australopithecines also lived on plant food. Tooth wear evidences a diet of leaves and fruits (Grine and Kay, 1988), and probably also tubers, seeds and insects (Isaak, 1978; Parker and Gibson, 1979). According to Meave Leakey and Alan Walker, "our evidence suggests that the earliest bipedal hominid known to date lived at least part of the time in wooded areas." Fossils buried near Ardipithecus ramidus, such as seeds and the bones of forest monkeys, imply that they lived in a closed-canopy woodland. Fossil evidence also supports the view that early hominids occasionally inhabited a riparian habitat. This data supports the view that Australopithecenes were primarily vegetarians. 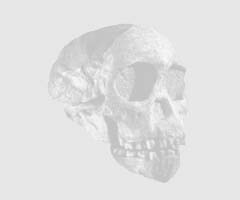 Australopithecus anamensis existed between 4.2 and 3.9 mya, and has a mixture of primitive and advanced features. The teeth and jaws of anamensis are primitive, similar to older fossil apes (Foley). At Kanapoi workers recovered two nearly complete lower jaws, one complete upper jaw and lower face, and several sets of isolated teeth. The thickened enamel suggests that A. anamensis had already adapted to a changed dietpossibly much harder food (Leakey, and Walker). Australopithecus afarensis existed between 3.9 and 3.0 mya, had a protruding jaw with large back teeth, and had more human-like teeth than that of a chimpanzee. The canine teeth are smaller than modern apes, but larger than those of humans, and the shape of the jaw is intermediate. Australopithecus africanus existed between 3 and 2 mya. It is similar to A. afarensis. Brain size was a little larger than chimpanzee brains. The teeth and jaws are much larger than those of humans, yet more similar to human teeth than to those of apes (Johanson and Edey 1981). The jaw shape is fully parabolic and canine size is reduced compared to A. afarensis. "Fossils of afarensis include various bone and joint structures typical of tree climbers," according to Meave Leakey and Alan Walker. Donald Johanson infers that A. africanus was vegetarian, "In my opinion, A. africanus, with its heavily buttressed mandible and expanded chewing teeth, forecasts the vegetarian specialization of the robust forms." Australopithecus aethiopicus existed between 2.6 and 2.3 mya. This species may be the ancestor of A. robustus and A. boisei. The brain size is 410 cc. The massiveness of the face, jaws and single tooth found, and the largest sagittal crest in any known hominid, are noteworthy. The Black Skull (A. aethiopicus), at 2.5 million years, is intermediate between A. afarensis and the later A. robustus and A. boisei. Australopithecus robustus existed between 2 and 1.5 mya. It had larger and more robust skull and teeth than A. africanus, with small front teeth and massive molars set in a large jaw. They had a brain size of about 530 cc with sagittal crests, evidence of large chewing muscles. This increase in brain size may be a reflection of overall size, not a significant evolutionary modification. Diet was probably coarse, tough food that needed a lot of chewing. Bones excavated with robustus skeletons may have been used as digging tools, also a vegetarian adaptation (Foley). The robust australopithecines with their massive jaws, greatly enlarged chewing muscles, and huge crushing and grinding molar teeth were specialized to process tough, fibrous, vegetarian diets (Johanson). Johanson wrote, "The vegetarian specialization of our robust relatives was a continuation of a longstanding dietary adaptation and feeding strategy among hundreds of species of primates." The robust hominids and their ancestors seem unlikely to have been meat scavengers, at least not in a significant way. Their brain sizes do not reflect a significant change from their predecessors, and therefore I conclude, based on all the factors discussed above, that they did not make very significant new adaptations to their environment at the time that genus Homo emerged. This may be why australopithecines are all extinct today. "We reconsider the new evidence for early dispersals in the light of climatic, morphological, technological and behavioral factors hypothesized for the emergence of Homo. We find that the striding gait, the elementary stone tools and the simple, but expansive, pattern of scavenging that characterizes the emergence of Homo also served its initial dispersal." A 1.8-million-year-old early Homo tooth fragment has been reported from Orce in southern Spain. A jaw bone of similar age was found in the Republic of Georgia. In Indonesia specimens of Homo erectus date to 1.6 to 1.8 million years. The success of the Homo diaspora evidences a successful new adaptation, and tool use was an important aspect of this adaptation. Stone tools in Pakistan have a paleomagnetic age of about 1.9 million years. The 1.9 my old Longgupo hominid, found in China, has teeth with affinities to early African Homo and possessed similar stone tools (Larick and Ciochon). This hominid is possibly more primitive than H. erectus (Beardsley). According to Larick and Ciochon, "The growing number of Asian hominid fossils and stone-tool assemblages that approach 2.0 million years in age now suggests that an early population of Homo arrived in eastern Asia within a few hundred thousand years of arising in Africa." Were the earliest tools used for scavenging only? Could scavenging alone have supported this rapid diaspora? Other mammalian species were also affected by Africa's changing ecology. Six species of African bovids dispersed to Asia during the Middle Pliocene, a surprising number. These bovids could have been hunted or scavenged by Homo and the two groups may have dispersed at the same time (Larick and Ciochon). Could pursuit by Homo hunters have been a factor in their dispersal? Was 'Homo the traveler' also a hunter capable of giving chase to an obvious huge banquet? By 1.9 mya Homo ergaster exhibited limb proportion and body size comparable to Homo sapiens and a cranium larger than that of Homo habilis (Larick and Ciochon). I suspect that the capability existed, and was used. Homo habilis existed between 2.4 and 1.5 million years ago. Evidence of tools found with habilis earned it the name, which means 'toolmaker.' H. habilis is similar to australopithecines but the back teeth are smaller, though still relatively large. Brain size, at between 500 and 800 cc, is considerably larger than in australopithecines and brain shape is more human like. One feature, the bulge of Broca's area visible in one habilis brain cast, suggests a possible capability of rudimentary speech (Foley). Organized social groups and vocal cues are adaptive to hunts. Early language could have capacitated successful group hunting. It is easier, therefore, to make a case for H. habilis being a hunter. Nonetheless, I view the ability to migrate over several continents to be more significant evidence of adaptation to meat eating and possible hunting than evidence of possible increase in vocal capability. Language has many uses besides hunting. Ten sites at Oldavai that date from the Homo habilis period contain Oldowan core and flake tools and animal bones (Feder and Park). Analysis of the bones from these sites indicated that they were mostly antelope lower legs, parts with little or no meat. The bones also show tool marks, sometimes overlying carnivore tooth marks, sometimes the opposite. Oldowan tools were definitely used for cutting meat. Because a greater proportion of the bones than expected represent animal parts with little meat, they appear to have been scavenged for marrow, not hunted. Was Homo habilis a scavenger, while the Homo that dispersed a hunter? All the Australopithecines and Homo habilis are only found in Africa. Early Homo and H. erectus were found through Africa and Asia. H. erectus existed between 1.8 million and 300,000 years ago. Their stone tools are more sophisticated than habilis' tools (Foley). Their average brain size was 900 cc in early specimens and about 1100 cc later (Foley). These differences also suggest a difference in adaptation. This change may have included hunting. While the limited evidence suggests that H. habilis may have only scavenged, hunting is not so different than scavenging. Once a taste for meat developed, hunting may have been only a thought away. Certainly, the earliest meat scavengers had the intelligence to understand where the meat derived fromliving animals. The simplest form of hunting, a chase, does not require stone tools which would be evidenced today. The pressures of existence and survival may have been greater the further early Homo moved from its tropical homeland, and therefore the likelier the possibility of hunting. In conclusion, the available evidence indicates that the emergent Homo species made a significant new adaptation to the environment in East Africa during the Middle Pliocene cooling. Unlike their robust Australopithecine cousins, they scavenged meat. And they used stone tools to do so. Scavenging and hunting capacitated survival in ecologies without the ancestral plants of the African tropics. H. habilis was certainly a scavenger, and possibly a hunter. Eating meat enabled a significant dispersal in more northerly latitudes and into new ecological niches. In all probability the earliest Homo to disperse from Africa was a hunter as well as a scavenger. This view provides the dispersing early Homo with a capability to explain its rapid diaspora and regional successes. Whoever that first individual hominid that taught his fellows to eat meat was, she/he certainly altered the course of history. Without that behavioral innovation, however repulsive it may have seemed to those ancient vegetarians, and without its cultural transmission, the species Homo sapiens may never have come into existence. We have to thank that ancient ancestor for our very existence, for the emergence of our genus. At the same time we should reflect on the number of species that may have fallen into extinction due to our omnivorous appetites and species success. In a sense this question is the story of the six billionth monkey! Or rather, hominid. Beardsley, Tim, Out of Food? http://www.sciam.com/0496issue/0496scicit01.html. Chiarelli, Brunetto, Some comments on the evolution of hominid intelligence., Mankind Quarterly, Fall, 1996, Vol. 37 Issue 1, page 29-37. Chiarelli, Brunetto, The `African Eve' theory in light of paleontological evidence for the outward diffusion of hominids., Mankind Quarterly, Spring 1994, Vol. 34:3. Feder, Kenneth L., and Michael Alan Park, Human Antiquity, Mayfield Publishing Company, Mountainview, CA, 1997. Foley, Jim, Fossil Hominids FAQ, talk.origins Archive, April 28, 1997. Grine, F. E., Kay, R. F., 1988, Early hominid diets from quantitative image analysis of dental microwear. Nature 333: 76S-768, cited in Chiarelli, 1996. Isaac, G., The food-sharing behavior of Protohuman Hominoids. Scientific American 238:4. pages 90-108, 1978, cited in Chiarelli, 1996. Johanson, Donald C., A skull to chew on., Natural History, May 1993, Vol. 102 Issue 5, p. 52. Larick, Roy and Russell L. Ciochon, The African Emergence and Early Asian Dispersals of the Genus Homo, Nov. 1996, http://www.sigmaxi.org/amsci/articles/96articles/Larick.html. Leakey, Meave; Walker, Alan, Early hominid fossils from Africa., Scientific American, June 1997, Vol. 276, Issue 6, p74. Parker, S. T., K. R. Gibson, A developmental model for the evolution of language and intelligence in early hominids. Brain Sciences, 2:367-408, 1979, cited in Chiarelli, 1996. Paxton, Steve and Terry McAndrew, Primate Behavior, http://www.leeds.ac.uk/chb/lectures/anthl_11.html. Pickford, M., Major events in primate paleontology; possible support for climatic forcing models of evolution., Antropologia Contemporanea, 9: 89-94, 1986, cited in Chiarelli, 1996. Your comments, etc. are appreciated. Contact. ©2000 by James Q. Jacobs. All rights reserved.